//Which side are you on? – Scott Bennett, New Zealand Unionist writing in 1910, Auckland. 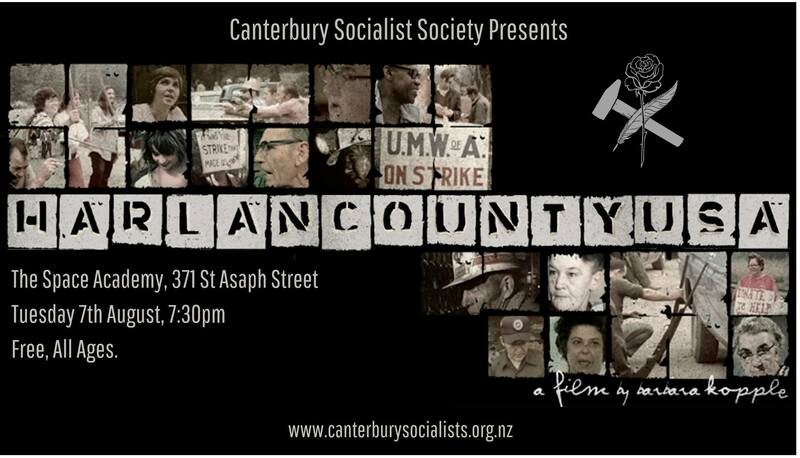 The Canterbury Socialist Society event for August is a film screening of Oscar-winning documentary “Harlan County, USA” directed by Barbara Kopple. The film chronicles the Brookside Strike, a miners strike in Kentucky in 1973. We are witnessing, and many of us participating in, an increase in industrial action in New Zealand, with the recent NZNO strike, MBIE workers, and further back the Lyttelton Port workers. First Union and Unite Union both continue a steady practice of using strikes in retail and fast food sectors, and there is a looming possibility of a teachers’ strike. Many strike actions have occurred but negotiations are still ongoing, so it is quite possible we will see further actions by the NZNO and others. With this in mind, learning about industrial disputes and tactics from the history of the workers’ movement seems prudent. All are welcome, the event is free, and Space Academy will have a variety of drinks and some food for purchase.